1 A None No Power Seat 1 A is a standard First Class Bulkhead seat. It can get very cold by the exits during flight. 1 C None No Power Seat 1 C is a standard First Class Bulkhead seat. It can get very cold by the exits during flight. 1 D None No Power Seat 1 D is a standard First Class Bulkhead seat. It can get very cold by the exits during flight. 12 A None No Power Seat 12 A does not recline due to the exit row behind. 12 B None No Power Seat 12 B does not recline due to the exit row behind. 12 C None No Power Seat 12 C does not recline due to the exit row behind. 12 D None No Power Seat 12 D does not recline due to the exit row behind. 13 A None No Power Seat 13 A is a standard Main Cabin Extra seat with a misaligned window. The tray table is in the armrest, which makes the armrest immovable and reduces seat width. There is also limited shoulder room and a missing arm rest on the wall due to the location of the exit row. 13 B None No Power Seat 13 B is a standard Main Cabin Extra seat. The tray table is in the armrest, which makes the armrest immovable and reduces seat width. 13 C None No Power Seat 13 C is a standard Main Cabin Extra seat. The tray table is in the armrest, which makes the armrest immovable and reduces seat width. 13 D None No Power Seat 13 D is a standard Main Cabin Extra seat with a misaligned window. The tray table is in the armrest, which makes the armrest immovable and reduces seat width. There is also limited shoulder room and a missing arm rest on the wall due to the location of the exit row. 17 A None No Power Seat 17 A has limited shoulder room and the noise from the engines may be bothersome. 17 B None No Power Seat 17 B has limited shoulder room and the noise from the engines may be bothersome. 17 C None No Power Seat 17 C is in the last row of this section and has limited shoulder room. The close proximity to the engines and lavatory may be bothersome. 17 D None No Power Seat 17 D is in the last row of this section and has limited shoulder room. The close proximity to the engines and lavatory may be bothersome. 18 A None No Power Seat 18 A is in the last row of this section and has limited shoulder room. The close proximity to the engines and lavatory may be bothersome. 18 B None No Power Seat 18 B is in the last row of this section and has limited shoulder room. The close proximity to the engines and lavatory may be bothersome. 2 A None No Power Seat 2 A is a standard First Class seat however, the tray table is in the armrest, which makes the armrest immovable and reduces seat width. This seat has a misaligned window. 2 D None No Power Seat 2 D is a standard First Class seat that has a misaligned window. 3 A None No Power Seat 3 A has a misaligned window. 3 D None No Power Seat 3 D has a misaligned window. 5 A None No Power Seat 5 A is a standard Main Cabin Extra seat. This seat may have extra legroom. There is no floor storage for this seat during takeoff and landing. The tray table is in the armrest, making the armrest immovable and slightly reducing seat width. 5 B None No Power Seat 5 B is a standard Main Cabin Extra seat with extra legroom. However this seat may be bumped by service carts or passengers passing by. There is no floor storage for this seat during takeoff and landing. The tray table is in the armrest, making the armrest immovable and slightly reducing seat width. 5 C None No Power Seat 5 C is a standard Main Cabin Extra seat. This seat may have extra legroom. There is no floor storage for this seat during takeoff and landing. The tray table is in the armrest, making the armrest immovable and slightly reducing seat width. 5 D None No Power Seat 5 D is a standard Main Cabin Extra seat. This seat may have extra legroom. There is no floor storage for this seat during takeoff and landing. The tray table is in the armrest, making the armrest immovable and slightly reducing seat width. 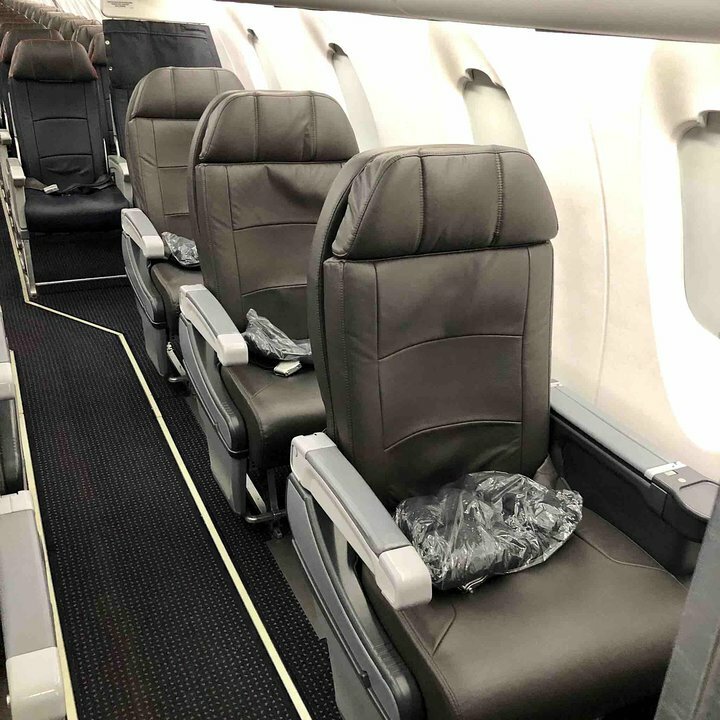 This aircraft has recently been reconfigured and now features three rows of First Class seating. Overall, this is a relatively narrow aircraft with limited overhead and under seat storage. Passengers will often be required to check-in suitcases at the aircraft door which can then be retrieved immediately upon landing. The aircraft is noisiest at the rear and seats towards the front of the cabin are recommended. There is no audio, video, or laptop power. Short flight from SRQ to DFW. Temperature was not a problem. Unable to store even a large paperback book in the overhead compartment on the left side of the plane. Would avoid this aircraft if possible. I was on a short hop from Fort Wayne, IN to Chicago's ORD for a connection. One must keep in mind that this is a small jet. I am grateful to AA to offer business class. I use this airline to get to ORD and DFW and enjoy the business class service. On some of the older jets the seat could use an refresh. But it does offer great leg room and normally good service for a regional jet. Seat depth, from back to front is short. Feels like your sitting on a bench seat... lots of leg room, no arm rest on the bulkhead. Pretty much a drag. An awful seat, only marginally better than many coach seats I've experienced over the years. There is no overhead space. I almost always check my luggage but for 48 hours I thought I'd just carry my bag on. The seat is not all that comfortable 1st Class is the farthest away from the bathrooms which are all the way in the back. Bad seat, bad layout, bad snacks. Not a good value. 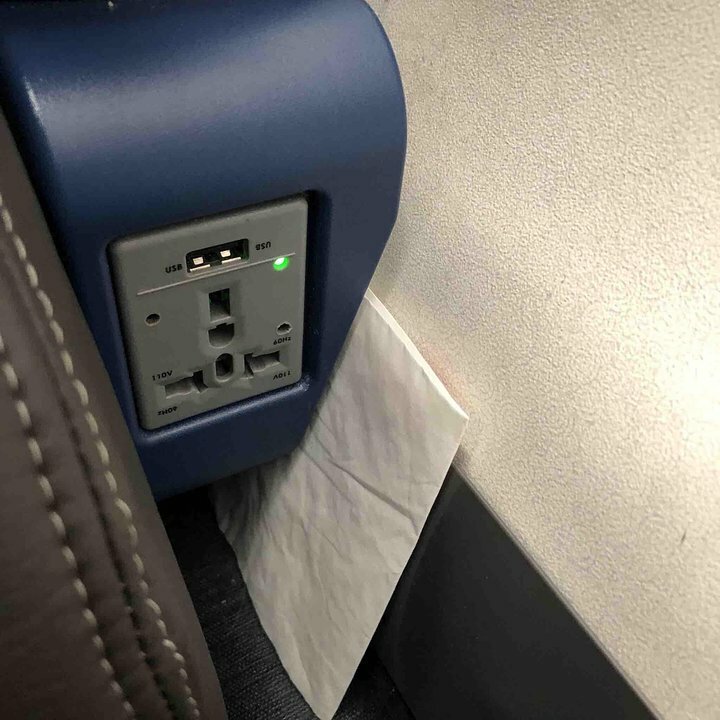 Very uncomfortable, waste of first class dollars. The overhead bins are tiny and all bags needed to be gate checked. Seat belt was too small. By far, the worst aircraft seat I have ever used. no need to buy 1st class, this seat is behind the curtain from 1st class. Don't pay to check baggage. You have to gate check at door of plane. View out window very nice, engine noise a problem, cannot hear cabin announcements during climb, no recline. Get an aisle seat because the window seats angle down & give little headroom. Gate check your bag because storage bins are small. Seat 2A on most CRJ700 s that I have been on has a scratched window due to repeated contact with Jet Bridge shrouds. Visiability is limited at best. This could possibly be the worst seat I have ever been seated in on an airplane! Getting hit in the head and shoulders by boarding passengers is a constant. Terrible seat, not worth the extra leg room. That has to be the smallest lav I have ever attempted to use. I flew coach, but I was surprised that first class did not have their own lav, had to use the one at the back of the plane. Overall a very uncomfortable plane for a 3+ hour flight. Plenty of room in this seat, downsides are that there are no overhead bins on this side of the aircraft. Biggest grumble is that they don't clean the seats - the leather is pretty ingrained filthy. Is it really too much to expect that the seats could be deep cleaned once in a while? Overall i had a very good experience. Aircraft amd seat better than i anticipated. Seat 3A gave me a suprisingly level of feeling of room and privacy, whichni know sounds odd. Crew was great and cabin was clean. The CRJ 700 operated by Envoy Air as American Eagle was better than I expected. I flew to and from Nashville and Chicago in the same day on this aircraft. I do not use a roll aboard, and this eliminated standing in the jet way to retrieve a bag. The seat was as comfortable as the slimline seats Southwest is using. The planes were clean, the air vents worked properly, and the beverage service was quicker than on a 737. 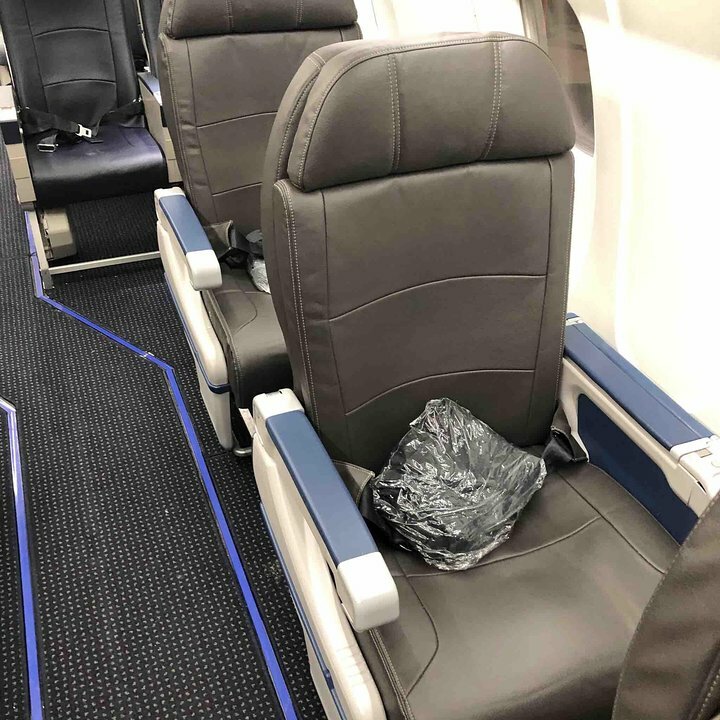 While this seat has leg room, there is no underseat storage for it and it's at an odd location as the aisle runs straight into it coming from first class. Which means, people, carts, etc. also do. I wouldn't choose it again, it's kind of annoying. To be honest, plane was terrible. Seat was okay, though dirty. Air vent on the roof didn't work, ac was blowing freezing air into feet all the time, plane was noisy when cruising and seatbacks are too short (I'm 5'9"). Pros that quiet during take off and flight crew collected trash many times. This was a relatively short flight from MDH-ORD on a CRJ-700. Seating was reasonably comfortable for economy in a regional jet. Cabin crew was friendly, but there was no real cabin service -- nor was any expected. I cannot believe law allows a seat to be so uncomfortable. The back has no lumbar support, the "padding" is at most 1" thick, the experience is like trying to get comfortable in a cardboard box. This is a lawsuit waitin to happen for sufferers of sciatica and other neurological condition. I am a 3 million mile AA customer. If this is an example of the new equipment AA has been promising for five years, count me out in the future. The seat was very comfortable! I'm a bigger guy, and I didn't feel cramped in this seat, as it was wide enough, and the leather cushion was fine. The first class service was great - they offered a pre-flight beverage, and 2 in-flight beverages, along with three offerings of snacks. I'm not sure if this is standard, but it was only a 45 minute flight from CMH to ORD. And the aircraft is MUCH quieter than AA's other regional gets like the EMBs. The bulkhead seats did seem to have cramped leg room (of which I in 2A had no issue). The table is a bit tricky to pull out, as it's located inside of the left arm rest. It's a bit heavy, so be careful. All in all, great flight, service, and comfort! I would consider seat 5B to be a bad seat. 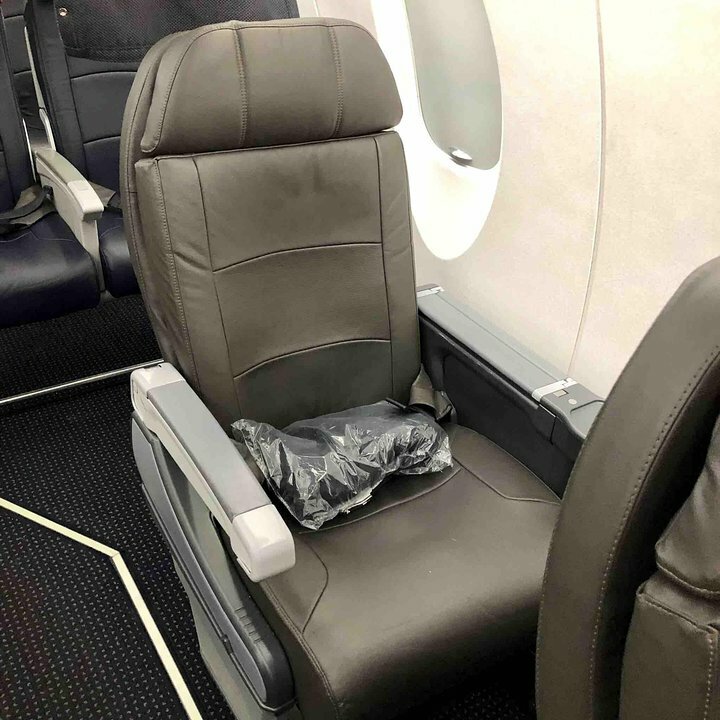 It's a bulkhead seat that requires you to put all your items in the over head bin, but the bulkhead is truncated, and that's a problem. 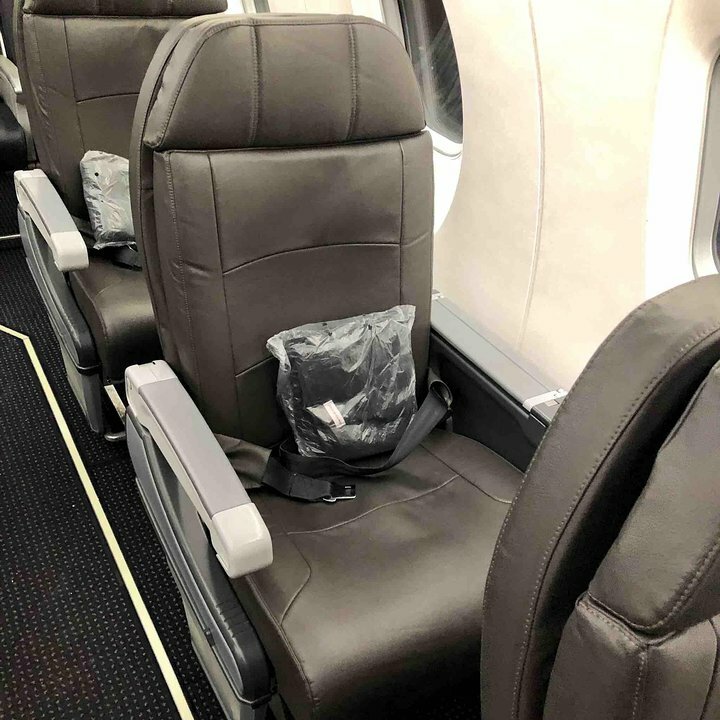 The seat is exactly at the transition point where the aisle narrows from First Class to Economy, and the truncated bulkhead leaves the right half of the seat completely exposed to boarding passengers. If you sit there you will be repeatedly pummeled by backpacks, shoulder bags, and heavyset passengers. Seat 1C has good leg room, but the First Class seats are very uncomfortable - the seat bottom is set at an uncomfortable angle - reclining doesn't help very much.